Usually I only talk about photography in this blog but this time I am going to do a little food review. The best thing about taking food photos is I get to eat the food afterward, spso I might as well do a little review. 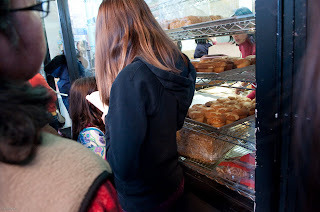 In San Francisco, there is a bakery called Golden Gate Bakery and its eggs tart are very famous. I think everyone lives in the Bay Area would know about them. 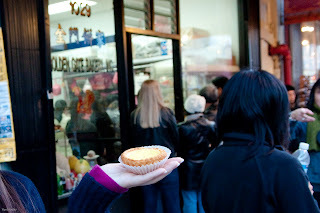 There is always a long line outside the shop and it can take half hour or longer before you can buy your egg tarts. Beside a month long vacation during the summer, the shop also closes for vacation many times during the year. So is their egg tarts really worth the trouble? Read on. I got an egg tart from Golden Gate and another one from a near by bakery called AA Bakery and did a little taste test. Here is a picture of them side by side, can you tell the different? Which one is which and which one tastes better? The one on the right is from Golden Gate and the one on left is from AA. The egg body of the one from Golden Gate is softer. The AA one is firmer. As you can see from the first picture, there are winkles on the egg body of the tart on the right because of its softness. The egg is also sweeter. As for the outer shell, the Golden Gate egg tart is flakier while the AA one is more dense. 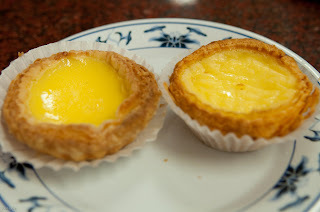 The "mouth-feel" is better with the Golden Gate egg tart. When the egg tarts were fresh out of the oven, the Golden Gate egg tart was better. I could definitely taste the different. However, we usually don't eat the egg tarts right after we buy them, so I also did an overnight test. I let the egg tarts stay in room temperature for over 12 hours and tasted them again the next day. After sitting overnight, the outer shell of the Golden Gate egg tart was not as flaky as before. The outer shell of AA egg tart was still about the same. Maybe it's because it's more dense. The egg body of the Golden Gate egg tart was still very soft and smooth but it tasted too sweet after sitting overnight. The one from AA tasted about the same as before. 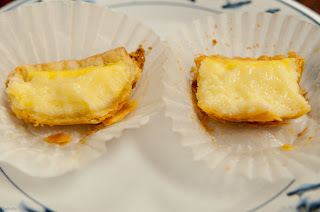 In summary, the Golden Gate egg tarts taste better when they're fresh out of the oven. The egg is sweeter and softer and the shell is flakier. However, they are $0.30 more expensive and you may need to wait in line for 30 minutes to get them. The AA egg tarts are not bad at all. They are cheaper and usually you can get them within 5 minutes of waiting. Also they still taste good after awhile. 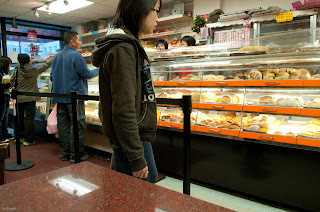 My recommendation is if you walk by Golden Gate Bakery and if you see a short line, you should definitely get some egg tarts and you should eat them right away. If you don't have time to wait and if you are planning to eat the egg tarts right away, you can save yourself some time and money by going to the AA Bakery.